Oracle has introduced couple of new features in Oracle SOA Suite 12c. I have listed couple of new features that Oracle introduced for developer in my post. These new features really make developers life easy as these reduce development cycle. Here we discuss about MDS and what all featured introduced in that. As we know MDS is used to store artifacts like WSDL, XSD, XSLT etc. we have two types of MDS, File based MDS and DB based MDS. 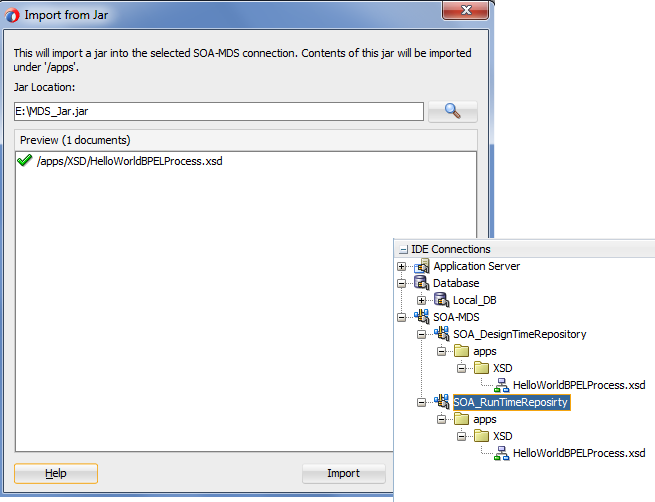 In Oracle SOA 12c, when we use default server which is integrated with Jdeveloper then we can use only Design Time MDS (File Based MDS), Run Time MDS (DB Based MDS) is not supported. Check this post to create design time MDS connection. In Oracle SOA 12c release, Oracle provided couple of new options that we can use when we use Design Time MDS, these options were not there in 11g. Below are options available with Design Time MDS. In this post, we discussed these options one by one. Get started with Oracle SOA 12c. 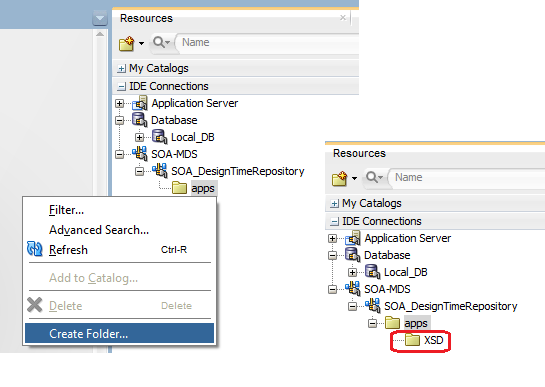 We can simple add and remove folders from design time MDS repository. To add a new folder to it, simply right click on the apps folder and choose “Create Folder”. To delete the folder, right-click on the folder and delete it. 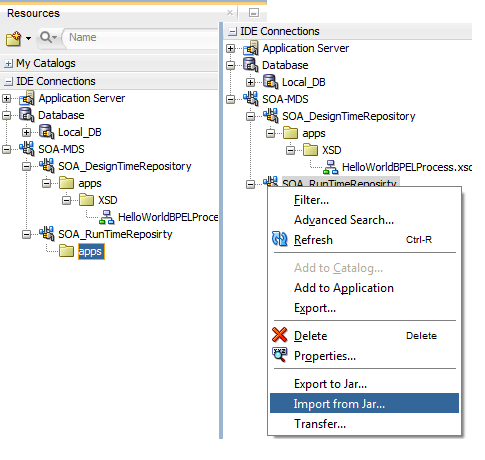 We can export MDS artifacts from one repository and import it to other repository. 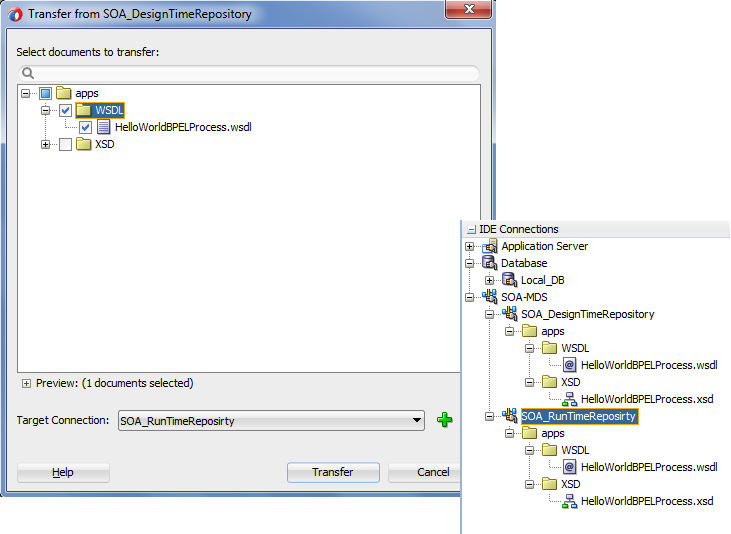 This is helpful when we want to add artifacts from Design time repository to run time repository. 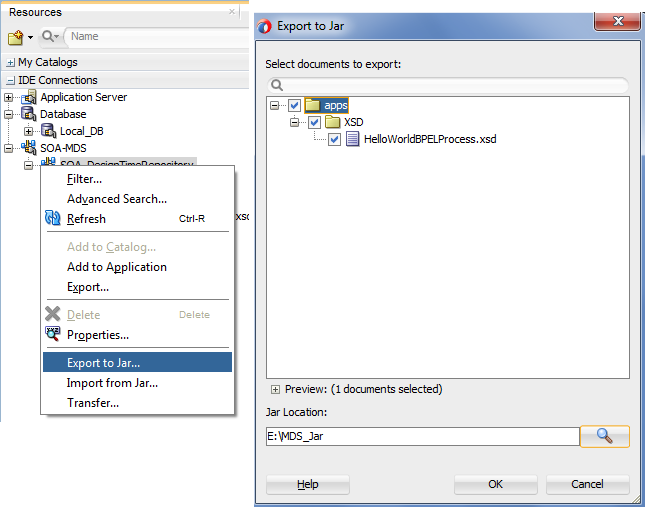 To export the MDS artifacts, right-click on MDS repository and choose “Export to Jar”. 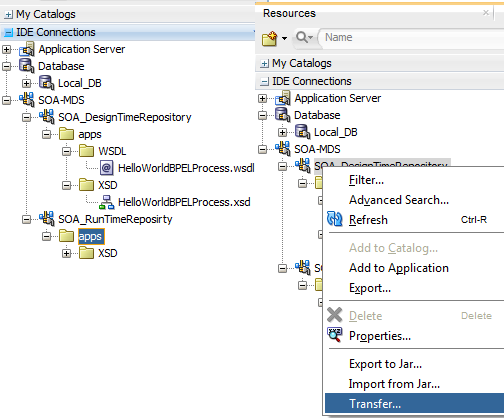 We can import the Jar to any other repository, to do that right click on the repository and choose “Import from Jar”. We can also transfer the files from one repository to another, to transfer the file right click on the file which we want to transfer and choose the target repository. 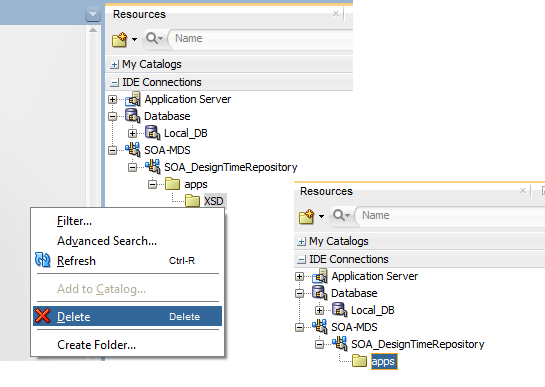 Click here to see how to share MDS artifacts to SOA Design Time Repository. 1. Through Jdeveloper: It compiles the composite and creates the Jar but ends with error saying: Partition Doesn't exist. 2. Through EM: I selected the jar which was created by Jdeveloper ande tried deploying from EM directly, this process doesn't move after giving username/password. Do you have any insight on this? It would be really helpful! Which JDK version are you using ? I am using jdk-7u65-windows-x64 on a Windows 7 64 bit OS. The Database which I installed is Oracle XE. Heyy This issue got resolved, I could deploy the composite, only thing needed was a restart, and after that in the EM, under default I could see many pre-deployed composites such as AIAAsyncErrorHandlingBPELProcess etc.